03/2009: On March 30, President Obama signed the Omnibus Lands Management Act of 2009, which created the Great Falls National Historical Park. The park includes the Colt Mill. 07/2010: In late 1996, the site underwent a stabilization project through funding from a $359,000 New Jersey Historic Trust grant and the National Park Service. This stabilization project accomplished three important steps. First, collapsed materials from the roof and walls were removed. As much material as possible was salvaged, photographed, and recorded by archaeologists. Second, structural support was added. Steel framing was installed to reinforce the walls, and mesh wire was installed on the interior to prevent further collapses. Finally, unstable remains of the second story were removed and the first story was capped with stone to stabilize it. The removed materials were numbered, photographed, and inventoried. Since the stabilization project, more steps have been taken to secure the future of the site. The Great Falls National Landmark District, of which the Colt Mill is a part, was declared a New Jersey State Park in 2004. In 2007, students from NJIT did an adaptive reuse plan for the Colt Mill. While the plan was never put into action, it was a positive step towards future planning ideas for the site. Additional investigations, including a cultural resource survey and archeological investigation, have recently been completed and the results are expected to be published in the fall of 2010. 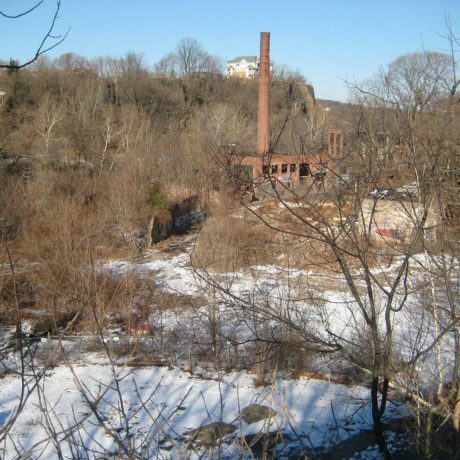 The Colt Mill is located in Paterson, New Jersey’s Great Falls/ S.U.M. National Historic Landmark District, just below the Great Falls of the Passaic, on a gentle bend in the river. It is one of the district’s most significant buildings. Constructed in 1835-1836 by Samuel Colt for his patent Arms Manufacturing Company, the building represents two of Paterson’s early industries. It was in this building that Samuel Colt, in 1836, produced the first repeating firearm. It was also in this building that John Ryle, “the father of Paterson’s silk industry,” produced what is thought to have been this country’s first skein of silk, in 1840. The building was a prime example of mid-19th-century architecture. Constructed of locally quarried brownstone, the building was originally four stories tall and included a bell tower topped with a wooden weather vane in the shape of a rifle. The building is badly deteriorated, with only walls and two floors remaining. There is a serious risk of development and complete collapse.